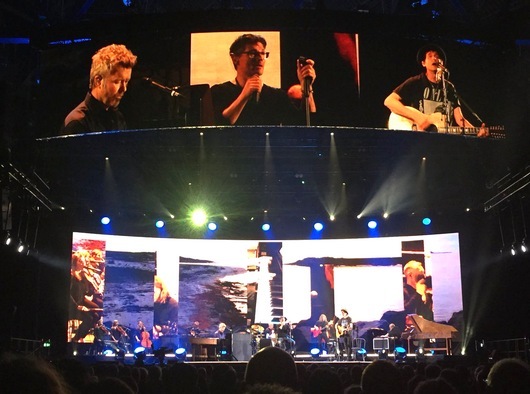 a-ha opened their 13-date MTV Unplugged Tour 2018 at the Schleyerhalle in Stuttgart, Germany last night, for an audience of around 6000 people. The setlist was the same as the concert at Giske last summer – apart from not playing the cover version of “The Killing Moon” and a different song order. Aftenposten’s music journalist Robert Hoftun Gjestad attended the concert in Stuttgart and gives it a 5/6 review, saying that “this was a-ha at its finest”. “Impressively, for the most part it turned out to be equally touching and musically warm inside the concrete hall in Stuttgart as it was in the far smaller venue at Giske where the live album was recorded”, Hoftun Gjestad writes. The stage design is among the most stylish setups a-ha have used to date, utilising two large, curved screens; one behind the band and one above the stage. Live video of the band is combined with animations and footage from Norwegian nature, including Morten Skallerud’s short-film Året Gjennom Børfjord from 1991, which was used in a-ha’s “Lifelines” music video. Fan pictures and videos have been fewer than normal for an opening night of a new tour, but this may have to do with an announcement that was made before the show discouraging photography and video. Apparently people who were taking photos/videos with their phones were asked not to by the ushers, one fan said. The merchandise stand seems to offer four new MTV Unplugged – Summer Solstice T-shirt designs with tour dates on the back, plus a hoodie/jacket. The new Savoy album on vinyl is also available. “Melancholy is seen as sad by some people, whilst for other people it’s a way of reflecting on things that have value to you. But “Brother” is kind of a war song at the same time; you are you, and you have the right to become you. And no one has the right to prevent or to stop that from happening. If I’m interested in you, I don’t want to change you into becoming something I like, so to speak. I should just welcome anything that you want to do to become you”, Morten said. Today he was in Stuttgart for an interview with SWR1, which can be heard on swr.de. It included the premiere of the full version of “Do You Remember Me?”, which is the second single off the album. There is also a gallery of photos on SWR1’s Facebook page. 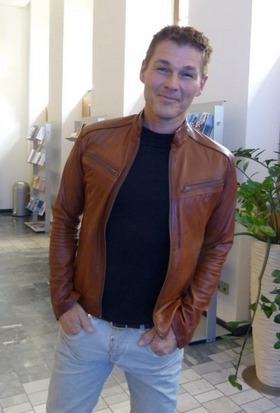 He also visited Radio 7 in Ulm today, where a lucky contest winner had a chance to sing “Brother” together with Morten. Interview clips, along with a YouTube video and photo gallery have been posted on radio7.de. Several other interviews have been taped and will air in the coming days and weeks. The promo tour, which continues with radio, TV and newspaper interviews for the rest of the week, will apparently also visit Baden-Baden, Mannheim and Hannover.